This comforting beef barley soup is just what you need to fend off the polar vortex. It is chock-full of goodness including beef, barley, mushroom, carrots, celery, garlic, leeks and potatoes. 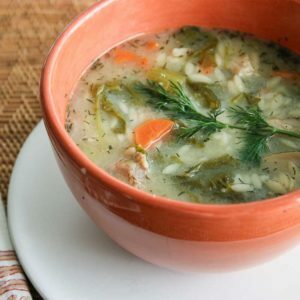 Beef barley soup is an old-fashioned soup that provides instant feelings of well-being. When I was a kid I loved any soup that had barley in it. I wasn't sure exactly what barley was, but I loved it's nutty chewiness. So what is barley exactly? Barley is a cereal grain that is used in cooking, brewing and to feed livestock. It has been cultivated for 10,000 years and was once considered a special food for gladiators, who were known as horderii, or barley eaters. Hulled barley has had its inedible outer husk removed, but still maintains its bran and germ and thus has more health benefits than pearled barley. Consider presoaking barley for one hour to 24 hours to reduce cooking time and to help absorption of nutrients. Pearled barley has been steamed and the bran removed and consequently is not quite as nutritious as hulled barley. Barley soups typically call for pearled barley. It cooks faster than hulled barley and releases starch into the broth which helps thicken the soup. 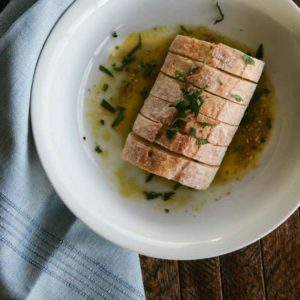 This recipe calls for pearled barley, but you could substitute hulled barley; it will just take a little longer to cook. Eating barley has many health benefits. Consuming barley helps to lower blood cholesterol, regulate blood sugar, balance gut bacteria and encourage weight loss. Barley is a good source of both soluble and insoluble fiber as well as a multitude of antioxidants, vitamins and minerals including: thiamine, riboflavin, niacin, vitamin B6, vitamin E, iron, magnesium, phosphorous, copper, zinc, potassium, manganese, selenium and more. I recommend toasting your barley to bring out its nutty flavor. This takes just a couple minutes in a dry pan. Be sure to stir frequently to avoid burning the grain. Use high quality bone broth. It makes a big difference. I am partial to Zoup bone broth, but there are several good ones on the market. Combine a mixture of chicken and beef broth. 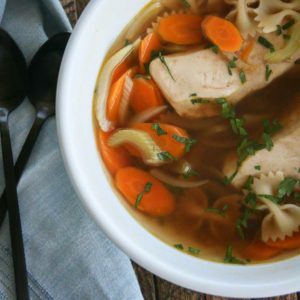 The chicken broth keeps the broth lighter and adds flavor. Season with Worcestershire sauce to add umami. The mushrooms and beef also contribute to umami. Use pearl barley which releases starch into the broth when it cooks, which in turn, thickens the broth. I use Zoup Chicken Bone Broth and Beef Bone Broth because I like the flavor and the short list of ingredients in each bottle. You can purchase this product on Amazon, but the shipping costs are very high. The Zoup website shows the grocery stores where Zoup broths are available. Note: SNFD is an Amazon associate and we may make a small commission when you purchase through our links. One of my readers recently and most generously sent me a Garlic Rock. When I opened it up my first thought was "Really? Why do I need a garlic rock?" Was I ever wrong. I really like this product. 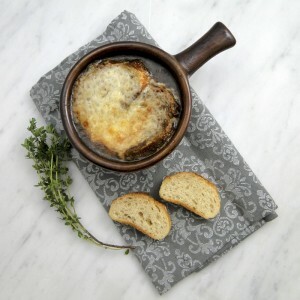 The garlic rock is a natural stone selected for its size, weight and hand shape. It makes peeling garlic a breeze. I have used all kinds of methods to separate and peel garlic cloves: back of the knife, smashing with a pot, cocktail shaker, two bowls, etc... I had passed on most of the gimmicky methods and settled on 1) using a pot to smash garlic heads to separate cloves, and 2) pressing individual cloves with the back of a knife to peel. Now I use my Garlic Rock for both. This tool breaks down whole garlic heads and peels individual cloves quickly, neatly and without risk of cutting yourself. So thank you to the kind reader who sent it to me. You left no return address so I have not been able to thank you personally. I really appreciate the gift and use my Garlic Rock nearly everyday. Thank you! I hope you enjoy this Beef Barley Soup. I suggest making a double batch and freezing the leftovers for future meals. Heat a large heavy-bottomed soup pt, such as a Dutch oven. Add the barley and toast over medium heat for 3 - 5 minutes until the grains take on a bit of color. Stir frequently and take care not to burn. Remove the grains and set aside. Add olive oil to the pan. Season the beef with kosher salt and pepper and sear on all sides. Remove from the pot and set aside, reserving any juices. Add more olive oil if needed and sauté the carrots, leeks, celery and garlic together for about 5 - 6 minutes until they begin to soften. Add the mushrooms and continue cooking another 10 minutes. Remove the vegetables and set aside. While the vegetables are cooking, chop the beef into bite-sized pieces. Return the beef and any drippings to the pot and add the chicken and the beef bone broth. Add bay leaves, thyme sprigs and Worcestershire sauce. Bring to a boil, reduce heat to low and simmer for an hour, until beef is tender. Add the barley after 30 minutes and continue cooking with the meat for the remaining 30 minutes. Add the vegetables and potatoes to the soup and cook another 15 - 20 minutes until barley and potatoes are done. Add the spinach to the pot and cook for an additional 5 minutes. Remove thyme stems and serve. Garnish with some grated parmesan cheese for a little extra umami if you like. You can add the thyme sprigs to the soup whole, just remember to pull out the stems before you serve. This soup freezes beautifully. If you plan to freeze or refrigerate some of the soup, do not add the fresh spinach to the portion of the soup you plan to freeze or refrigerate. Adding the fresh spinach right before you serve the soup keeps the spinach a beautiful bright green color. The barley will continue to absorb broth after you freeze and defrost it so you may need to add more liquid to your defrosted soup. You can add plain water or a little more chicken broth. Isn’t it a great tool? In addition to peeling garlic I have used mine to pit olives and crush fennel seeds. I learn more uses every day. Who would have thought a rock could be so handy??? ?